Please call the Riverside Water Plant at 847-931-6106. 2. I have low pressure. Who do I call? If the pressure is low all over the house, you can call the Water Dept. Meter Division at 847-931-6162 and they can investigate. If the pressure is low at only a few sinks, you can do some investigating. Remove the aerator from the faucet and inspect for debris that may be obstructing water flow. The debris may be sediment from your plumbing or it may be pieces of your hot water heater’s dip tube (a plastic rod from the inside of your hot water heater that has been proven defective in certain models. All hot water heaters manufactured between 1993 and 1997 could have faulty dip tubes.) Dip tube debris will be white, gray or light-green tinted granular or eggshell-like particles. Place some of the debris in a small glass of water. If it floats, it’s probably dip tube pieces. This is a hot water heater manufacturing problem and will need to be addressed by a plumber. If you have questions about this, call the water quality laboratory at 847-931-6158. 3. Do I need a water softener if I am on City water? Although adding a water softener is an individual homeowner’s choice, we at the Elgin Water Department feel it is unnecessary. Elgin water has already been softened between a soft to moderately hard level (according to industry standards). Water that is too soft makes it difficult to remove soap from your hands or detergent from your laundry. Water that is softened beyond our treatment process can be aggressive to your plumbing and may cause your plumbing to rust. Hard water can lead to excessive scaling of pipes and water fixtures. 4. My automatic dishwasher operator’s manual says that the amount of detergent I need to use depends on the grains per gallon of hardness in the water. What is the hardness of City water? City of Elgin water has seven to eight grains per gallon of total hardness. 5. Does Elgin add fluoride to the City water supply? Yes, fluoride is added so that the level in the drinking water is 0.7 mg/L as required by the Illinois Department of Public Health for dental health. 6. What is the sodium content in Elgin’s water? Elgin’s water contains approximately 60 milligrams per liter (mg/L or ppm) of sodium. 7. Is radon a contaminant concern in Elgin’s water? No, radon is not in surface water supplies such as the Fox River. Radon that may naturally occur in groundwater is removed during the lime-softening process. 8. Why does the water have a chlorine taste or smell? How can I remove it? Chlorine is added during the treatment process as a disinfectant to kill bacteria and prevent it from growing in the distribution system. Chlorine is left in the water to maintain disinfection right to your tap. To remove any taste or smell, fill a pitcher full of water and refrigerate overnight. The chlorine content will dissipate. 9. Why is my water cloudy? It looks milky. Normally cloudiness is due to air dissolved in the water. If you fill a glass of water in a clear glass, and the water clears from the bottom up, it is dissolved air. This is a natural phenomenon and is perfectly safe. This occurs more frequently when the water is cold. Watch a video on the water department where cloudiness is specifically addressed. To jump right to that reference, scrub video to the 7:45 mark. 10. My water is suddenly rusty. What should I do? Who should I call? If your cold water appears rusty all of a sudden, it is probably due to a work crew in the area. They may be isolating an area to do emergency repairs, or opening an area hydrant. This stirs up sediments in the water mains. The rusty water is harmless and will clear up all by itself within a couple hours. Running the water in your faucet will not make this clear faster. If after several hours, or if a rusty condition in your cold water persists, call the water quality laboratory at 847-931-6158. 11. Do you give tours of your water treatment plant? Yes, we are proud of our facility and enjoy giving tours. We encourage our citizens to schedule a tour and see where their tap water comes from. Please call or email Tina Misicka at the water quality laboratory 847-931-6151, to schedule a tour (due to elevated security concerns, the City of Elgin may restrict or cancel tours with little or no notice. Please contact the Department for information). 12. What’s this pink stuff in my bathroom? Are you seeing a pinkish substance on your bathroom fixtures that is very persistent, appearing in the shower, sink, or along the water line of your toilet bowl. When you ask your neighbors, they don’t seem to have the same problem. What is causing this? The pink residue is the result of naturally occurring airborne bacteria. The bacteria produces a pinkish film, and sometimes a dark gray film, on surfaces that are regularly moist, including toilet bowls, showerheads, sink drains, and tiles. These bacteria thrive on moisture, dust, and phosphates, and are widely distributed, having been found naturally in soil, food, and also in animals. The conditions for the survival of the bacteria are minimal, and they may even feed upon themselves in the absence of other nutrients. Many times, the pinkish film appears during and after new construction or remodeling activities. The dirt and dust stirred up from the work probably contains the bacteria, once airborne, they seek moist environments to proliferate. Some people have even noted the pink residue in their pet’s water bowl, which causes no apparent harm and can be easily cleaned off. Others have indicated that their experience with this nuisance occurs during a time of year that their windows are open for the majority of the day. These airborne bacteria can come from any number of naturally occurring sources, and the condition can be further aggravated if customers remove the chlorine from their water by way of an activated carbon filter. In the past this type of bacteria was considered harmless, but more recently some species have been linked to human urinary tract infections, secondary wound infections, and pneumonia. 13. What are these black (or red) particles coming out of my faucet? Are you seeing black (or red) colored particles or specks coming out of your water faucets? They may be almost microscopic in size, such that the water looks black coming from the faucet, or they may be individual particles that are easily visible in the water stream. When you remove the faucet aerator do you find these particles on the strainer? When you isolate one of these particles on your finger tip do they smear like tar when pinched and rubbed? The particles are coming from a flexible hose that connects your faucet to the rest of your home plumbing system. 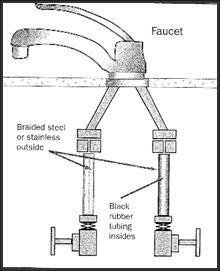 These connectors can be identified as the stainless steel braided hose that runs from the local shutoff valve to the attachment at the base of the faucet (see diagram). The stainless steel hose has a liner made from an acetonitril based rubber. The rubber liner can soften and deteriorate in the presence of heated water from your hot water heater. Hot water kept at a temperature above 148.0 degrees will hasten the softening and deterioration of this rubber liner. The chloramine disinfectant used by The Water Dept. to maintain the safety of the water supply will also soften this type of rubber liner. As the hot water dissolves the liner, particles begin to slough off and are carried away in the water stream. The particles can also show up in the cold water if the seal between the hot and cold water inlets has failed in a mixing type faucet. The City of Elgin Water Department does not recommend the use of this type of flexible connector in your indoor plumbing. The connector should be removed and replaced with standard copper tubing of the appropriate diameter. In the interim until you can get the connectors replaced maintain your hot water heater thermostat at a lower setting.